And just like that, we’re on the other side of the restoration. No more disassembly, no more removal, no more stripping; now, we’re putting Humpty Dumpty back together again. On Friday, Dad and I erected a small structure of aluminum poles in the garage, 20ft x 10ft x 8ft in all. While I was working out on Saturday morning, Dad picked up a heavy-duty air compressor and all the necessary safety equipment we would need for the day ahead. 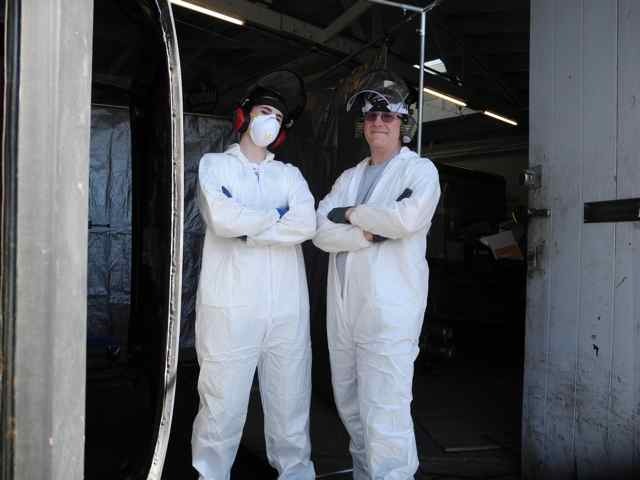 We met up at the garage, draped our containment structure with tarps, and hooked up the blaster to the compressor. We donned our Tyvek coveralls, breathing masks, face shields, and earmuffs. Then we began to blast. 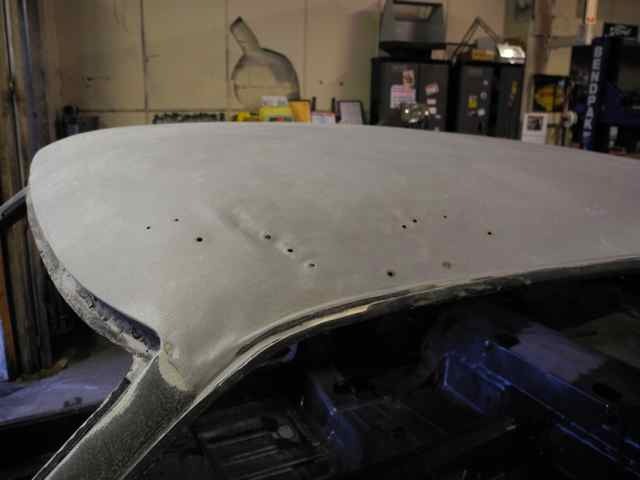 The ground glass that the DB150 uses cuts through primer and rust surprisingly fast, which made the stripping process fairly quick: in all, we did the entire car in only 3 hours over two days. The part that slowed us down, however, was the immense amount of body filler on the roof, which took a lot longer to blast through. In places, there was Bondo laid 1/2 inch thick. Beneath these spots we found holes poked through rippled sheet metal, evidence of a cheap repair job (we’ll clean these up later with a hammer and dolly, and hopefully do a much better job at applying the filler). Another factor that slowed us down was the face shields—every time one of us accidentally blasted into a pocket or depression, the media would shoot right back at us and cover our shields, which needed periodic cleaning. Aside from the roof, we also cleaned up the entire underside, both rear quarter panels, the cowl, and parts of the engine compartment and inner wheel wells. Preparation and clean up took far more time and effort than the actual blasting. After the first day, we found that the entire garage had been dusted with a light layer of glass, so on the second day we added an overhead cover to our blast booth. Even then, all of the glass left a complete mess. The drop-clothes that we laid down caught a lot of it, but were so heavy when we rolled them up that they needed to be put on a dolly to be transferred to the dumpster. After much hosing and sweeping, we finally cleaned the garage, sidewalk, rotisserie, and booth materials (the face shields we consigned to the trash). Getting glass off of the car was much harder, so we’re letting it dry before we try to vacuum it out. 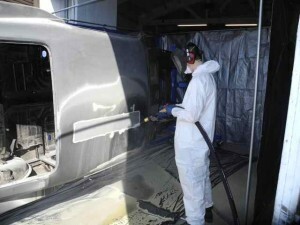 Then we’ll apply a rust inhibitor to all of the exposed sheet metal and get ready to start body work. Whoa. Considering how long it’s been since my last post, I’m embarrassed to say that the status of the Mustang is largely unchanged. Not that I haven’t been working at the garage; far from it. But the taxi has been so much of bother that I haven’t found time to work on the car that actually deserves my attention. The London Taxis Inc. TXII that my dad purchased has been nothing but trouble from the beginning. For as long as we’ve owned it there have been electrical problems galore. We first noticed when the battery was dead every other time we went to start the car. Thinking there must have been some appliance draining power, we installed a battery cut-off, which slightly extended the battery life but failed to fix the problem overall. Our next thought was to check the alternator’s voltage output, which registered low. Larry, our TXII expert in South Carolina, sent a new one and suggested we also increase the belt tension. We replaced the alternator and attempted the tighten the serpentine belt, whereupon we discovered that the belt tensioner had been stripped by the previous owner, and the tensioning spring stretched as a result. We replaced the tensioner, tensioning spring, and belt, and finally achieved the right tension. However, as if that weren’t enough to deal with, we performed a voltage drop test across the alternator cable and negative battery terminal, which registered at a whopping 0V. When we tested it against the positive battery terminal, though, we got the full 12V. Seeing this, Dad was able to recognize that the cable connection between the battery must have been grounded someplace between the starter and the alternator. Rather than messing with the wiring harness, we installed a bypass cable straight from the battery to the alternator, and now the car runs fine (hallelujah). With all that finally out of the way, I returned to my long-neglected project. With the ‘stang on the rotisserie, I removed and inventoried every last part on the body: emergency brake cable, brake fluid lines, assorted rubber plugs, interior trim brackets, etc. On to the stripping…. I helped Dad move the Citroen H-van out of the way so we could put the Mustang in a place to begin stripping the primer and body filler currently on the car. Apparently, many paint shops won’t supply a warranty on a car that has been soda-blasted, because the soda reacts with acid-based chemicals laid down before the paint, so Dad sold our soda-blaster to buy a Dustless Blaster, which uses a combination of water and glass beads to strip paints and primers in a much cleaner and environmentally-friendly way. This weekend we’ll erect a small containment structure of pipes and drop-clothes. You are currently browsing the Three Lions Garage archives for July, 2012. 47 mySQL queries in 0.180 seconds.